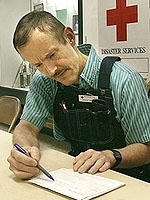 AUGUST 6--Though many key details of the federal investigation of bioweapons researcher Bruce Ivins have already leaked, today's unsealing of 436 pages of documents provides some new information about the government's probe of the late government employee whom prosecutors believe was solely responsible for the deadly 2001 anthrax attacks. The government's circumstantial case against Ivins, who committed suicide last month, is sketched out in affidavits filed in support of 14 search warrant applications filed since November 2007, when agents raided Ivins's home, cars, and his safe deposit box. As seen here, included in the affidavits is the government's bid to possibly explain why Ivins sent anthrax-filled letters to Tom Brokaw (an NBC investigative reporter had filed a Freedom of Information request regarding Ivins's laboratory work) and U.S. Senators Patrick Leahy and Tom Daschle (the pols's pro-abortion stance angered Ivins, a practicing Catholic). The documents also describe how Ivins created a bogus e-mail trail in a bid to deflect investigative attention from him to two other scientists at Fort Detrick, where Ivins worked. The documents also describe Ivins's fascination with the Kappa Kappa Gamma sorority and how he engaged in an 'edit war' on the group's Wikipedia page. Ivins, investigators reported, repeatedly posted negative information on the KKG page and was angered when it was removed from the site by other users. In a February 2007 online posting traced to one of his e-mail addresses, Ivins bizarrely claimed that the sorority had, many years earlier, labeled him an 'enemy' and had issued a 'Fatwah' against him.